Sails / Products - Racing Sails - Kent Sail Co. 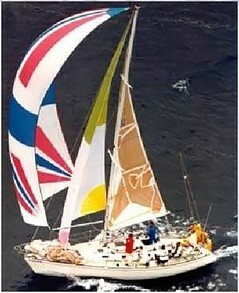 Racing sailors usually opt for the top of the line racing options for their sails. 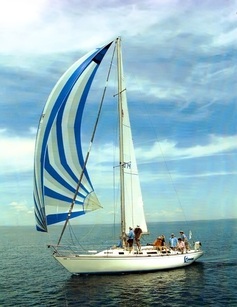 Each sail is usually custom designed to accommodate class rules, fabric used, and options selected. We highly recommend that you consult one-on-one with us when you are ready to choose these specialized sails. We work with several different sailcloth manufacturers that design and test fabrics for racing sails exclusively. We work closely with them in cloth selection and sail design. Because sailcloth changes each season, it is advisable that you consult with a sailmaker each time you invest in a new sail. Along with all of the new cloths come new ways to cut sails. Originally, laminate fabrics required that sails be tri-radially cut - an intensive cost both labor and time-wise. Now we use Flex laminate cloth that allows a crosscut design, giving you an efficient laminate racing sail for less money. 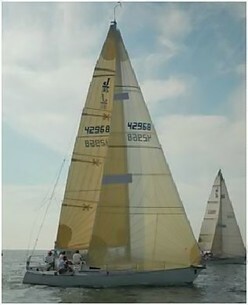 Racing spinnakers can be made in several different weights of nylon sail cloth - which varies depending on the use of the sail.